Hollywood has the Oscars, the Golden Globes, the Emmys, and more, but the advanced energy industry has its own stars to celebrate, too! With awards season in full swing, last week, we recognized Representative Ryan Costello (R — PA, 6th District) with AEE’s Advanced Energy Leadership Award during Energy Forward: Driving Advanced Energy Growth, our annual gathering of AEE members and state and regional partners, Feb. 27-28. A theme that emerged throughout the two days was the need to more effectively share our stories. Just as the film industry looks to tell stories that make characters relatable, we need to tell stories that connect our industry — and the individuals within it — to the broader economy. We need to boost our ratings by making advanced energy hyper-local, highly relatable and personal. We kicked off with a successful AEE Lobby Day covering 55 meetings with Congressional delegations from 13 states, including all key committees affecting our industry. 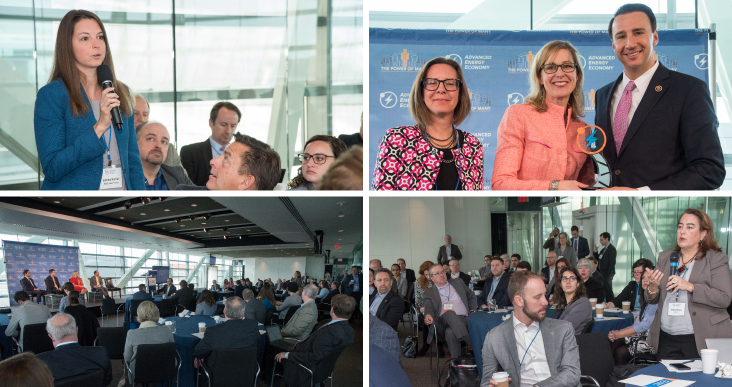 After an early morning briefing hosted by AEE Leadership Council member Microsoft, three dozen representatives of our member companies and state partners set off to Capitol Hill. An evening networking reception hosted by Affiliate member Perkins Coie provided a welcome opportunity to rejuvenate and to share stories of the day. Day two included over 100 participants from member companies, affiliates, and state partners, who spent the day grappling with the biggest challenges and opportunities before our industry, and gearing up for the year ahead. During a midday panel, led by interim CEO, Heather O’Neill, six members of AEE's Board of Directors provided insights into why their companies are deeply engaged with AEE and expressed their commitment to the organization, appreciation for AEE leadership, and excitement for the path forward. They included Mark Goodwin, Apex Clean Energy; Paul Kaleta, First Solar; Mark Laabs, American Efficient; Scott Neuman, Oracle Utilities; Kevin Self, Schneider Electric; and Jim Steffes, Direct Energy. The need to put a face to advanced energy wove its way into multiple topics in our member-driven agenda, including “Market Solutions to Deploy Advanced Energy.” Ably moderated by Neal Kemkar of AEE Leadership Council member company GE, this discussion brought in outside opinions from Jason Stanek, Senior Counsel for the U.S. House of Representatives Committee on Energy and Commerce and Subcommittee on Energy, Heather Reams of Citizens for Responsible Energy Solutions, and Josiah Neeley of R Street Institute. After delving into the details of various acts and actions on the Hill, a question was raised about how to get our message across in a truly bipartisan manner (an ongoing goal of AEE). There was broad consensus that there is a need to cultivate relationships and to educate through story telling — make it personal, make it local, share our economic impact. AEE Action Fund, which seeks to elect champions to state legislatures across the country who will work to expand opportunities for advanced energy — energy efficiency, energy storage, demand response, and renewable energy — to compete in the energy marketplace. Advanced Energy Works, a campaign that will soon launch to elevate the voice of workers to ensure our elected officials in statehouses and Congress support policies that create and sustain advanced energy jobs (coming soon to a state near you). Beyond gathering our members for a day of collaborative engagement and discussion, at Energy Forward our team seeks to exemplify the way we work, and the value of our big-tent approach to advanced energy policy to those who are most directly impacted by our work. One way we hope to streamline our industry’s collaboration and impact is through our new, streamlined members-only portal where members can customize their participation in our array of business councils, working groups and access to our PowerSuite regulatory and legislative tracking tool. Another example of this secondary goal was our final panel of the day, “Collaboration for Impact: Partnering with Allies.” This animated discussion, moderated by Bonnie Datta of Siemens (also an AEE Leadership Council member) brought together Jeremy Harrell from ClearPath, Emily Fisher from Edison Electric Institute, Ben Prochazka, from Electrification Coalition, and Jason Burwen, from Energy Storage Association. In this conversation, panelists articulated the value of collaboration and tips to recognize and create opportunities for collective action moving forward. Member strategy sessions also covered our industry’s collaboration with regulators, utilities and others, and dug into evolving Federal and state energy policies. We had lively conversation leaders including AEE member representatives Polly Shaw with Stem, Rick Counihan with Nest Labs and Ray Hohenstein of Fluence, and industry experts Eli Hinckley with K&L Gates, Douglas Smith with Van Ness Feldman, and Suedeen Kelly, former FERC commissioner with Jenner & Block. AEE team members Maria Robinson, J.R. Tolbert, Lisa Frantzis, and Hannah Polikov were also on hand to guide these critical discussions. In many ways, Energy Forward told the story of who we are as an organization today: collaborative, forward-thinking, poised for new challenges ahead, and grateful for recent victories — at FERC, in Virginia, and beyond. Together with our members, we’re re-writing the script on policy transformation. Join us, share your story, be a part of the business voice for advanced energy!